The following steps will walk you through deploying a simple Tomcat application using Cloudsoft AMP. There are two methods of deployment detailed in this tutorial, firstly using virtualization with Vagrant and then installing AMP on AWS. To get you up-and-running quickly, the Vagrant option will provision four compute nodes for you to deploy applications to. None! This tutorial takes you from a fresh start to an AMP with a deployed application. For development and testing or when there are only a handful of VMs being managed, a small VM is sufficient. For example, an AWS m3.medium instance with one vCPU, 3.75GiB RAM and a 4GB disk. For larger production uses, a more appropriate machine specification would be two or more cores, at least 8GiB RAM and 100GB disk. The disk is just for logs, a small amount of persisted state, and any binaries for custom blueprints/integrations. Vagrant is a command line utility which acts as a wrapper around virtualization software such as Oracle VirtualBox to automate the creation and configuration of local development environments. We recommend its use when following these Cloudsoft AMP tutorials. Be sure to select these Cygwin packages when running the Cygwin installer. If you already have Cygwin installed, simply re-run the setup executable and follow the installation prompts to install the necessary packages. CentOS / RHEL You will need Java or JDK (version 8) installed. From Downloads, please download the .rpm package. replacing xxxxxxxx with the appropriate value from the filename of your download. This will install the AMP binaries in /opt/amp, and start AMP using the appropriate service management tool for your system (e.g. upstart). Ubuntu / Debian You will need Java or JDK (version 8) installed. From Downloads, please download the .deb package. This will install the AMP binaries in /opt/amp, and start AMP using the appropriate service management tool for your system (e.g. systemd). You will need Java or JDK (version 8) installed. From Downloads, please download the tar.gz archive. Extract the tar.gz archive and navigate into the expanded cloudsoft-amp-karaf-4.0.0-20160830.1700 folder. From Downloads, please download the zip archive. Extract the zip archive and navigate into the expanded cloudsoft-amp-karaf-4.0.0-20160830.1700 folder. Launching Vagrant for the first time can take a while. When it is finished it will display, in large text, the word “Started” in the console. The AMP host that you have started in Vagrant now needs some nodes to manage and run workloads on. We will create a number of BYON (Bring Your Own Nodes) instances within Vagrant. N.B. Additional nodes can be configured in servers.yaml if desired. You should now be able to login to the AMP user interface (as admin/password) on port 8081 of the server, such as http://localhost:8081/. To set your own credentials see Setting Web Credentials. AMP is managed as a system service using the appropriate tool for your system (e.g. systemd). When the AMP package is installed, the amp service is started for you. Configuration can be edited at /etc/amp/. Logs are written to /var/log/amp/amp.info.log and /var/log/amp/amp.debug.log. AMP is managed as a system service using the appropriate tool for your system (e.g. upstart). When the AMP package is installed, the amp service is started for you. Configuration can be edited at etc/. Logs are written to data/log/amp.info.log and data/log/amp.debug.log. Configuration can be edited at etc\. Logs are written to data\log\amp.info.log and data\log\amp.debug.log. You will need to restart the AMP instance for the changes to take effect. The default location for persistence data for AMP is ~/.brooklyn/brooklyn-persisted-state. This can be changed by updating the persistenceDir and persistenceLocation values in the file /etc/org.apache.brooklyn.osgilauncher.cfg. Locations are the environments to which AMP deploys applications. Most commonly these are cloud services such as AWS, GCE, and Microsoft Azure. AMP also supports deploying to a pre-provisioned network or to localhost (useful for testing blueprints). 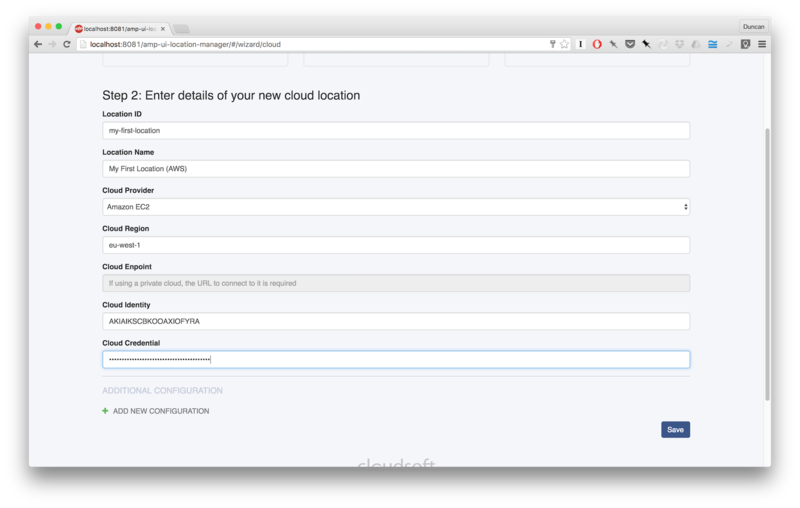 If you are following the Vagrant steps then you can use the provisioned VMs as part of a Bring Your Own Nodes network or you may follow the steps for setting up an AWS-based location. If you have have deployed AMP on Linux then you will need to use a cloud service (i.e. AWS) for the rest of this tutorial. Start by clicking Location Manager. You will be taken to a page showing the currently configured locations. As this is a fresh install of AMP it is unlikely that you will have any locations configured. Enter the following details as pictured. The password for vagrant is “vagrant”. To provision to AWS you will need to have an AWS Account. Swap the identity and credential with your AWS account details. Click + Add Location at the top right of the page. Enter the following details as pictured. 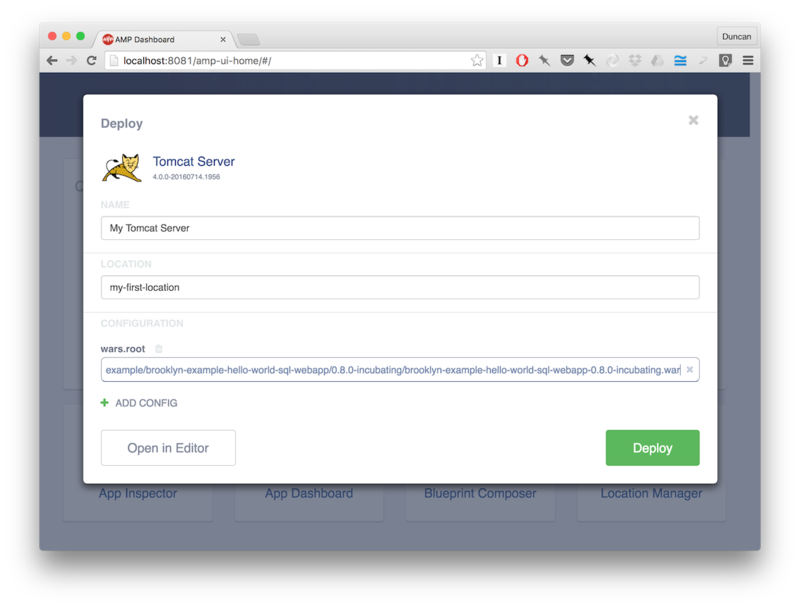 We are now going to deploy a Tomcat server with a simple application using the Cloudsoft AMP user interface. If you have set up an AWS location then AMP will first provision a VM. If you have set up a Vagrant-based BYON location then AMP will take the first unused VM from the pool that you configured. Let’s now deploy the Tomcat Server application. Depending on your version of AMP, you may find it in the quick launch section; if this is the case, just select it. If you don’t find Tomcat in the quick launch section though, just click Catalog, then Types. You can find it there by typing “Tomcat 7” in the “Search for bundles or types” box. Click it to go to its detail page, then click the “Deploy” button. Enter a meaningful name e.g. My Tomcat Server. In the Location box start typing “My First Location”. It should auto-complete. The AMP examples provide a simple example WAR that you can use (link below). This file contains the simple, existing Java web application that AMP will deploy and manage. Copy the link into the wars.root config box. Click on the View link in the notification that appears in the bottom left of the page. You should now see a page showing that your Tomcat server is STARTING. Wait until the Tomcat server is shown as RUNNING (you may need to refresh the page to see this). The App Inspector gives you a detailed look into the state of your deployed application. For now, we will just use it to access the web app that we just deployed and then to stop it and tear down the VM we created. On the left you will see a list of applications that have been deployed. At the moment you should see a single application made up of a single Tomcat Server instance. 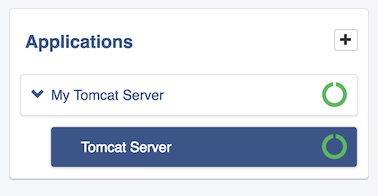 Click the Tomcat Server entity. Click the sensors tab on the right-hand panel. This will show us data specific to the deployed Tomcat. Use the filter to find the webapp.url sensor. Copy the sensor value (i.e. the web URL) to a new tab or browser window. You should now see the Hello World app that we deployed. Congratulations - you have now deployed your first application using Cloudsoft AMP. Let’s now tear it all down. The next steps will stop your Tomcat Server and, if you have provisioned one, destroy your VM. Return to the App Inspector and click on your top level application (My Tomcat Server). Click on the Effectors tab. Click the Invoke button next to the stop effector. Return to the App Dashboard http://localhost:8081/amp-ui-app-dashboard/ via Home –> App Dashboard. Your Tomcat application should now be STOPPING. Once it has stopped it will disappear from the list of deployed applications (you may need to refresh the page to see this). Congratulations! You have successfully used Cloudsoft AMP to deploy, manage and tear down an application.